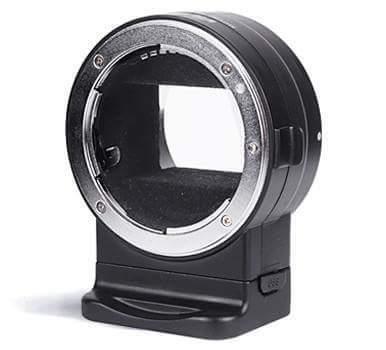 The Hong Kong-based company Viltrox will launch three new electronic autofocus adapters and one of them (model NF-E1) will allow mounting Nikon F-mount lenses on Sony E-mount cameras. In addition to autofocus, the adapter can transmit EXIF data and control the aperture. There are several other brands that make similar adapters. "Viltrox will launch 3 new electronic adapters for Sony E mount and Micro Four Third cameras. NF-E1 allows Nikon F mount lenses to be used on Sony E mount cameras. EF-M1 and EF-M2 are electronic adapters for Canon EF and EF-S lenses to be used on Mirco Four Third camera. EF-M2 also equipped with 4 elements in 4 groups which increase aperture by 1 stop and reduce focal length by 0.71x. All adapters come with USB port for firmware update. Retail price, product details and launch date to be confirmed. Please LIKE our FB page for latest announcement." Update: this is a freshly developed adapter and it is not related to any of the other manufacturers (not a re-badged product). This entry was posted in Nikon Lenses and tagged Adapters, Nikon F-mount to Sony E-mount AF adapter, Viltrox NF-E1 electronic autofocus adapter for mounting Nikon F-mount lenses on Sony E-mount cameras. Bookmark the permalink. Trackbacks are closed, but you can post a comment.